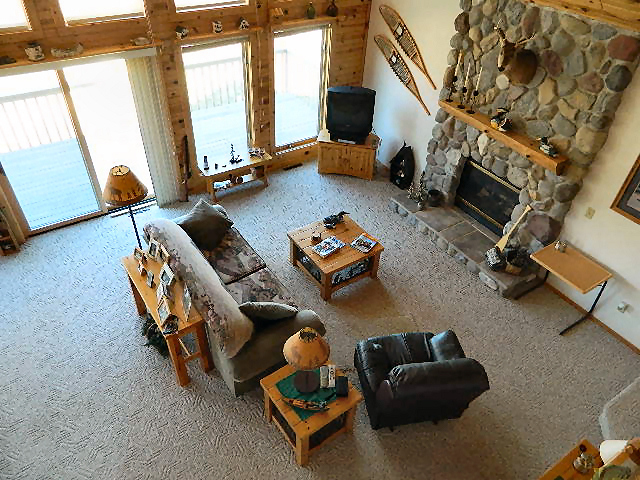 This is a must-see for any buyer looking for a quality, well-designed waterfront chalet in the Northwoods of Wisconsin. closet also houses the alternative laundry hook ups-allowing for convenient main level laundry if you wish. 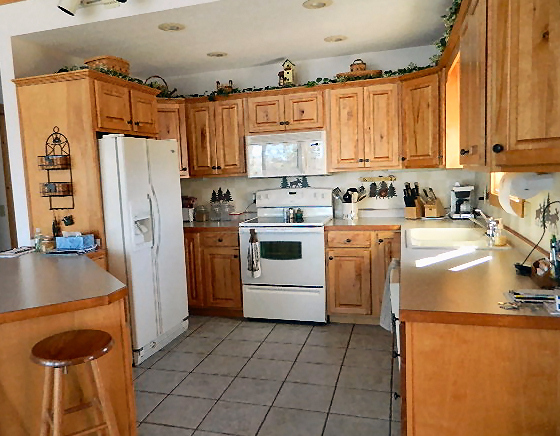 The sunny kitchen is nicely appointed with a side-by-side refrigerator, flat-top stove, built-in microwave and dishwasher. Plenty of room to make that gourmet meal or visit with your guests at the island counter-top. I adore the open living area of this home! Bright, airy, and tastefully decorated. The 9 foot walls throughout this home add loftiness and their painted finish brings a brightness to this home that many chalets lack. The lakeside wall of towering windows overlooks the sparkling water; enjoy impressive sunsets from your living room or from the large wrap-around deck. The beautiful stone gas-log fireplace will warm your spirits making for cozy winter gatherings with friends and family. The large loft is exceptionally well-done; it has plenty of extra storage, plenty of natural light and it shows off the vaulted pine ceilings well. 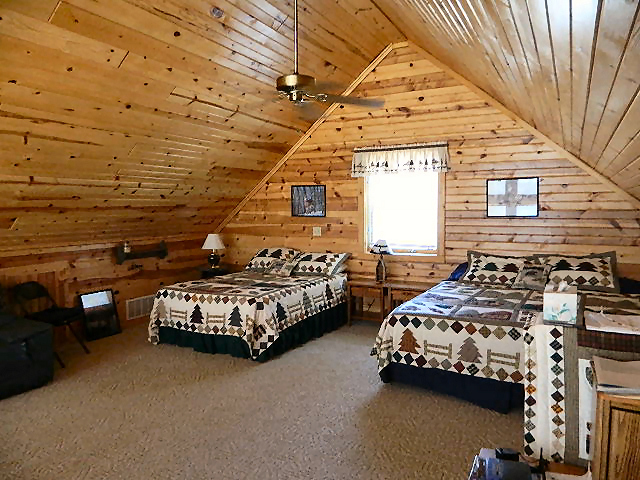 Down the main floor hallway you will find a delightful master bedroom suite area. This generous-sized bedroom has a deep walk-in closet and windows on both outside walls. 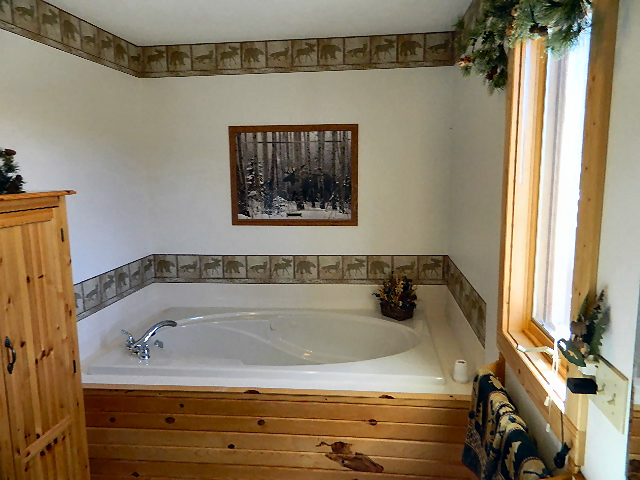 The bathroom across the hall is enormous and well-thought out; soak in the over-sized whirlpool tub, or enjoy the large walk in shower. 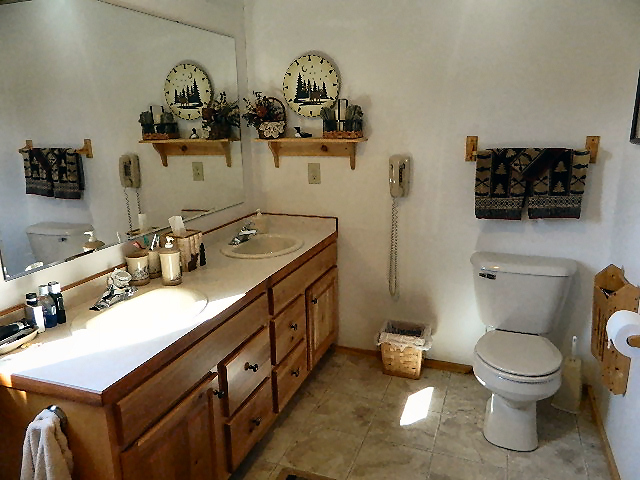 There is a double sink vanity, plenty of storage space and even a handy phone jack wired in! Closets and storage galore throughout this home, and all set off nicely with 6-panel doors to complete the north-woods touch. 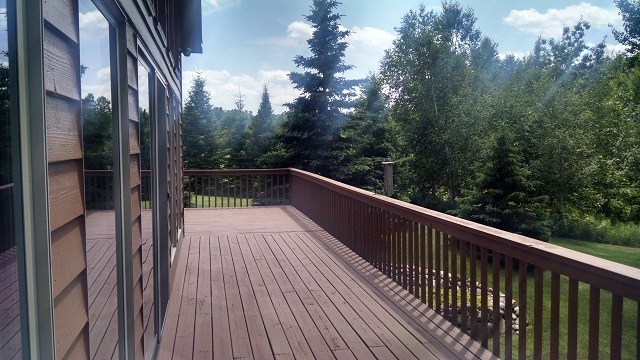 Custom window coverings are included with the home, even the sheer sun shades on the upper chalet windows. 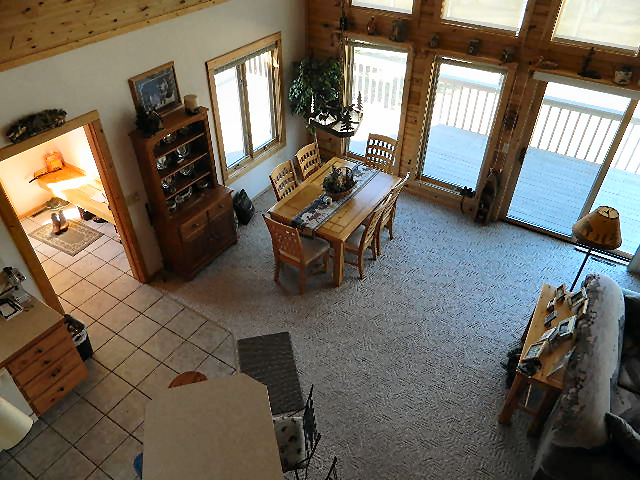 The lower level walkout hosts a fabulous family room with in-floor heat and plenty of windows for an impressive view of the lake! Plumbing is in and ready for the bar of your choosing, you will thoroughly enjoy entertaining in this room! 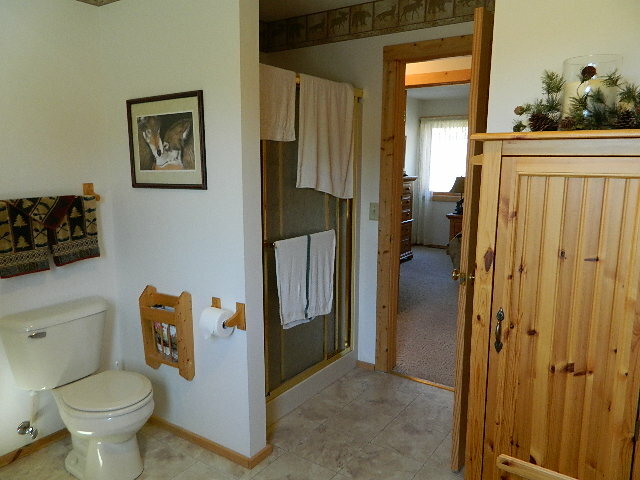 A full bathroom with a large closet is down the hall, along with a large bonus room. The utility room offers you another option for your laundry equipment besides housing the essentials; forced air furnace, central A/C, and a water softener. This home is well wired with many phone and internet access jacks throughout, and even is wired for an external generator! Outside there is a detached garage that can house three vehicles, it has a metal roof like the house does, plus a nice overhang on one side for even more storage. Even the nice storage shed in the back yard has a metal roof! 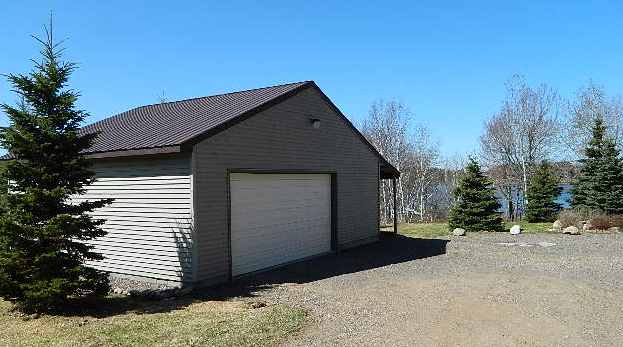 The lot is very desirable – level with a very slight slope to the water’s edge. Professionally landscaped with the perfect mix of open space and trees, the yard is all ready for you to enjoy. 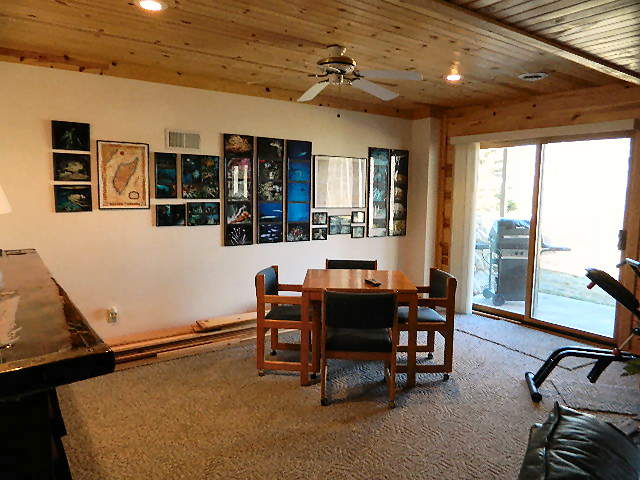 Over 2 acres gives you plenty of elbow room while the wooded area roadside provides privacy. 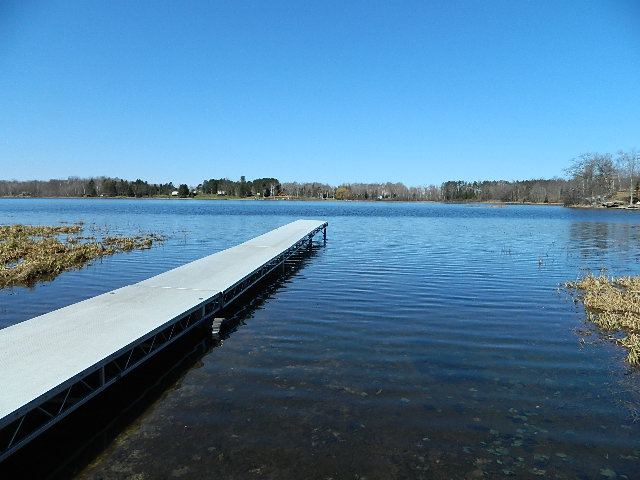 My seller’s son has enjoyed years of bass fishing on this lake and it has also been consistently stocked with Walleyes. There is an active lake association which organizes and maintains the fish stocking program here. You’ll appreciate the clear water and privacy while boating- there is no public access to this spring-fed lake. The 64-foot aluminum Floe dock comes with this home, so all you need is your boat or pontoon and you’ll be ready! 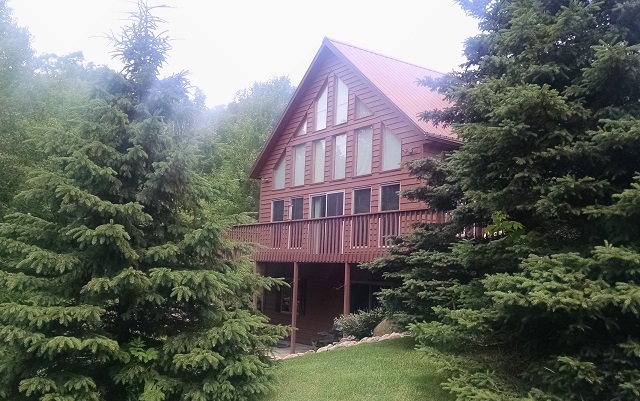 This house was built in 2001 and has a conventional septic system and a drilled well. Everything I’ve seen here has been thoughtfully built and meticulously cared for. 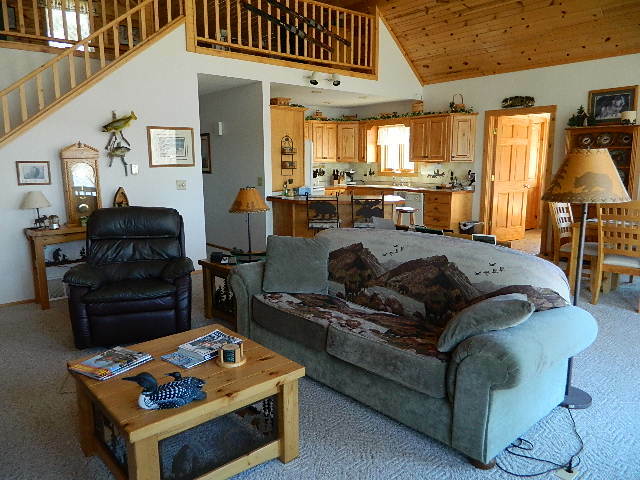 This chalet is only about a half hour from Hayward-that is not far when I think of how it used to take me 45 minutes to get from one side of Madison WI to the other side. The Winter and Ladysmith areas are close by and are rich with many good places to eat and visit, plus Ladysmith offers more shopping opportunities if you don’t want to drive to Hayward. Outdoor enthusiasts will appreciate the close access to the well-maintained snowmobile and ATV trail systems. 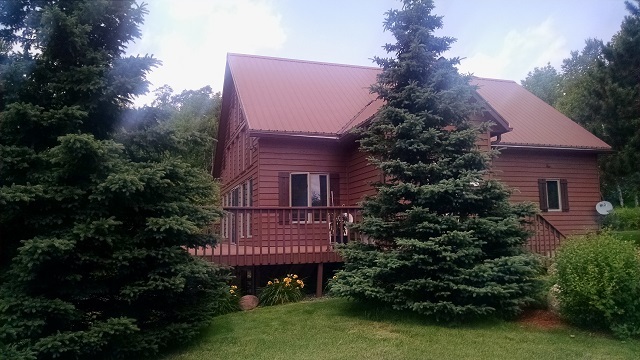 Most of this seller’s furnishings are also negotiable; many beautiful, custom made pieces with northwoods accents, all of which look spectacular in this home. Contact me today to see this fine waterfront home- you will be enchanted by it! 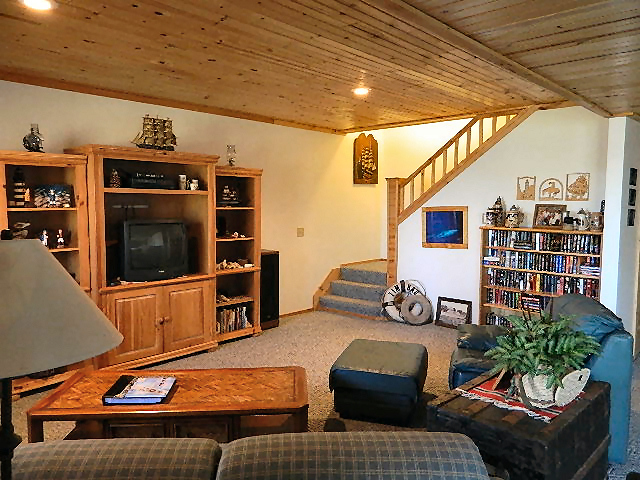 This entry was posted in Chalets For Sale Hayward, FEATURED PROPERTIES, Uncategorized, waterfront chalets and tagged 5325 w perch lake road winter wi, cathy lareau realtor, chalet for sale hayward, chalets on lakes hayward, lakehomes hayward wi for sale, waterfront homes hayward wi, winter wi lakehomes for sale. Bookmark the permalink.